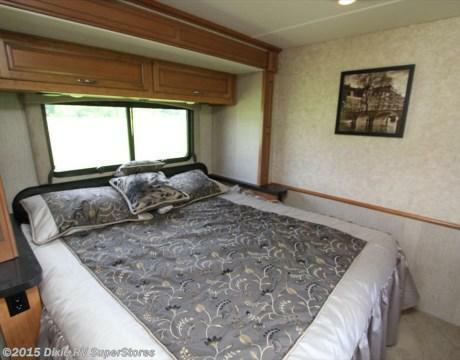 Fleetwood just released a luxurious and affordable line with the 2016 Bounder series. The Bounder has 5 thoughtful and varied floor plans. 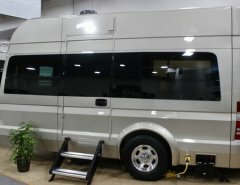 The 33C motor home with a length of 34’3” and a height of 12’10”, has a clean exterior with many safety features such as: automotive safety glass, running lights, entry door with screen door and deadbolt lock, door side porch light, power entry step, and hydraulic 4-wheel disc brakes with 4-wheel ABS. The engine and chassis is a Ford 362hp. 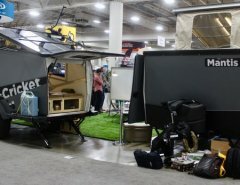 Other features include 22.5” aluminum wheels, 4-point automatic levelers, and a trailer hitch with a 7-pin electrical hook-up. Storage is ample on the exterior keeping all luggage and storage safe and secure with deep bins that are accessible and easy to reach. Interior storage is ample as well, and with a sleek, warm and inviting interior, you will be living comfortably on your travels. 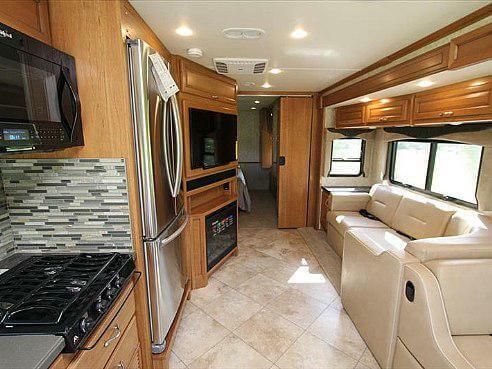 The Fleetwood Bounder 33C features dual pane windows, 2 sliders for added space, an electric patio awning with LED light stripe, and frameless flush mounted windows. The interiors feature residential finishes for that at-home feel while you’re on the road. 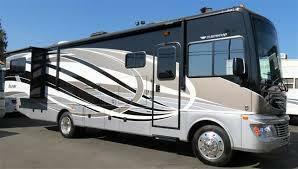 The Fleetwood Bounder has been nearly everyone’s first RV, and most loved. The 2016 does not disappoint. 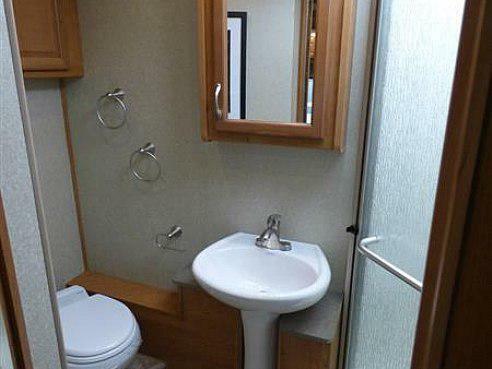 In the rear of the motorhome is a private bedroom with a slide, a queen size bed, ample dual wardrobes, nightstand and dressers and a 32” LED TV. Beyond the bedroom is the bathroom with gorgeous wood cabinetry, linen cabinet, sink, porcelain commode, and corner angle glass shower enclosure with skylight. The galley is a fully equipped kitchen with a 12 cu. ft. 4-door refrigerator, 3 burner stove, convection microwave oven, large double stainless steel sink and faucet with pull out sprayer. No convenience left out along with beautiful finishes to make you feel truly comfortable in your home away from home. The living room has cozy furniture with a 40” LED HDTV with additional storage behind the TV. Also, composite tile flooring for easy cleaning and maintenance, and a DVD home theater sound system. The galley and living room area feature a pantry, dinette, sofa and cabinet slide. 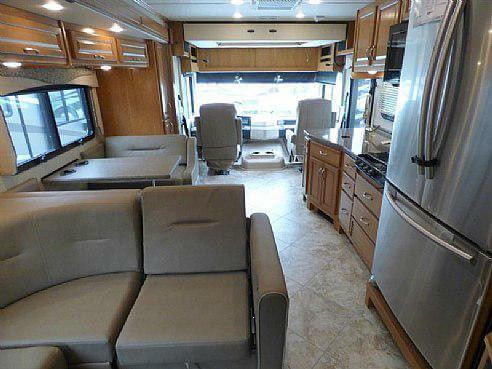 The Bounder has plenty of overhead cabinetry throughout for storage. You can choose options for additional tv’s, exterior entertainment center, a range with an oven, a washer dryer, electric fireplace, etc. 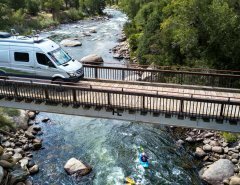 This is a build-your-own motorhome to enable you to have all the features you require for your comfort and convenience, As much or as little as you would like, all with the technology and beauty you enjoy.